Did you know that once gum disease forms it cannot be cured? 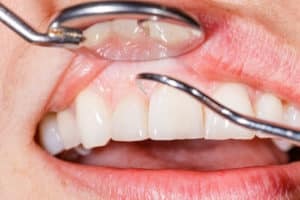 While we can definitely take steps to manage the disease and protect your smile from serious complications or the advanced stages of the disease, you can’t cure periodontal disease. However, if you recognize the warning signs and seek treatments in the inflammation stage you can potentially avoid the onset of periodontal disease. There are a number of different ways to help prevent gum disease. Improve your diet: When you consume foods and drinks high in calcium and vitamin D you help improve the strength of your teeth and jawbone, which can help protect them from complications related to periodontal issues. Foods high in both vitamin D and calcium include lean meats, dairy products, and leafy vegetables. Brush and floss properly: One of the major causes of gum inflammation, also known as gingivitis, is plaque buildup. To help control the amount of plaque that builds up on your teeth you should always brush and floss. You need to brush two times a day and floss once a day. See your periodontist: Your periodontist can provide dental cleanings and other preventive treatments to help protect your gums from the onset of periodontal disease. You should visit us if you encounter the warning signs of inflammation. Treatment at this stage is crucial for avoiding the onset of gum disease. Stop smoking: Using tobacco products can worsen gum disease, increasing the risk of tooth loss. We suggest you quit smoking right away. After all, in addition to tooth loss and stained teeth, tobacco products can lead to cancer. Don’t ignore pain/redness: You should see your periodontist once you notice soreness in your gums or a red appearance. In addition, don’t ignore bleeding when you brush or floss. See your periodontist right away for a thorough diagnosis.